I was actually searching for another beef noodle when I bumped into this recipe. I ate this before in Vietnamese restaurants, some being really tasty and some forgettable. Still having a big container of beef stock powder that was given to me by my brother, I made this noodle, shortcut way by using stock powder instead of beef bones. If you need a recipe with beef bones, please refer to source. And if you want to know where my brother got the beef stock powder, it's at Jaya Grocer, at the Korean food section. The beef here is raw, cooked by merely pouring boiling broth over it. Hence, it's really tender and pink. I don't know if you noticed, both pictures lacked something, hahaha. The 1st bowl lacked lime and the 2nd lacked beansprouts, LOL. Talk about being anxious to eat, one for me, one for my hubby! 1. Half onion and ginger, leave the skin on. Place a rack on top of the stove. Turn on the fire and turn it to medium low. Put the onion and ginger on the rack, cut side down and roast it until it chars slightly. Rinse both ginger and onion to get rid of any loose char bits. 2. Place charred onion and ginger into a 5L capacity pot (you can use a bigger pot, of course). Put in all the spices and water. Bring to a boil and lower to a simmer for 1 hour. Strain the broth and discard the solids. 3. Return the spiced broth to the pot and bring to a boil. (top with water if water level has gone too low, I maintained a 3L amount) Put in beef stock powder (or cube), fish sauce, rock sugar and cook until everything dissolves. Taste. Add salt if necessary. 4. Cook beef balls at this point if needed. Turn heat off until it’s almost time to serve. 5. When it’s time to serve, bring broth back to a hard rolling boil. Place some noodles into a big bowl. 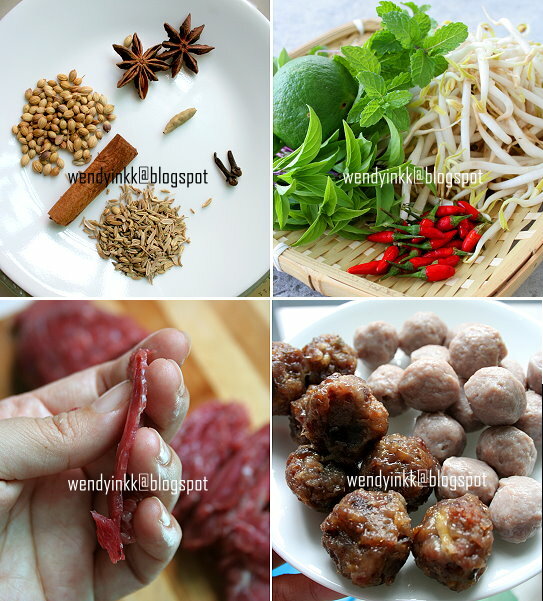 Arrange some beef balls and tendon balls. Then lay beef slices on top of noodles. Bring soup to a rolling boil and pour boiling broth over the raw beef. Top with preferred condiments and serve. Not a beef person, but I'm salivating looking at the tiny chillis.. 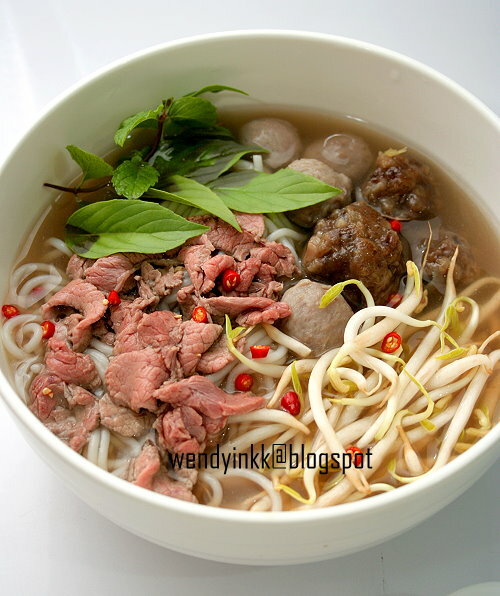 I love beef noodles! At the Vietnamese restaurant I won't order anything else. Just this! 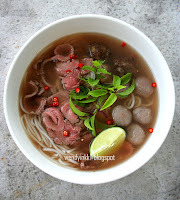 From my last Hanoi trip, actually their Chicken pho also very yummy wor..love your quick version using stock powder..
Yup i also use beef tock cubes, saves so much time. Love those beef tendon balls!! wow,this is a perfect dish for fall season!! thanks for sharing,wendy. Wow, looks perfect & yummy. May I know what brand/type of dried rice noodle you used here as I've not seen such thick noodle before. Thanks. 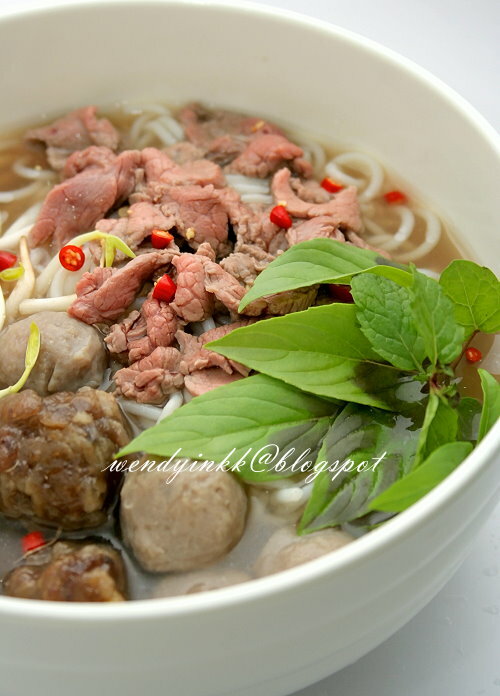 Wendy, this remain me of my late mum (from Ipoh & excellent cook too)use to make fresh tendon beef ball for us to eat. It was so yummy & too bad that I was too young & did't learn from her.I wonder if you know how to make tendon beef balls? it's a Made in China Guangxi thick vermicelli "chou mai fun". I bought mine in Tesco. sorry, no idea on how to make. Soupy noodles are the best thing to have this monsoon season, nothing like a nice warm bowl of soup. All the 3 noodles in this series look delish! I would like to have a bowl as my bf in this raining morning! Please!